Adolescent and young adult dating violence, which encompasses both victimization and aggression, is a significant public health concern. Some studies estimate that as many as 10% of high school students have experienced dating victimization and nearly 20% have reported physical violence toward a dating partner. “While intimate partner violence (IPV) has been recognized as a significant problem among adults, little is known about this violence and aggression in adolescent and young adult populations,” says Vijay Singh, MD, MPH, MS. It is important to examine dating victimization and aggression among both sexes because dating violence is common in both men and women, according to Dr. Singh. “Assessment of both dating victimization and aggression is lacking in the literature,” he says. “Dating violence is different from adult IPV in that relationship roles are not yet set. Many adolescent couples aren’t living together and there is a tendency for them to change partners more often than adults.” Patterns that begin in adolescence can carry over to adulthood, including IPV. In the Annals of Emergency Medicine, Dr. Singh and colleagues had a study published in which they screened 4,089 males and females aged 14 to 20 who sought ED care. Dating victimization was defined as violent acts received by a young adult, whereas dating aggression referred to violent acts perpetrated by youths. These acts included throwing objects at someone; kicking, hitting, or punching; slapping or pulling hair; and pushing and shoving. According to the results, more than 15% of the sample reported past-year dating violence (Table 1). “Almost one in five females and one in eight males reported past-year dating violence,” Dr. Singh says. This prevalence was higher than what has been seen previously in school-based samples. Of female patients involved in the study, nearly 11% reported any dating victimization and about 15% reported any dating aggression. For males, about 12% reported any dating victimization and nearly 5% reported any dating aggression. Among those with dating violence, nearly one in three patients reported both dating victimization and dating aggression. Several themes also emerged with regard to demographics, associated behaviors, and ED health service use for any dating violence, any dating victimization, and any dating aggression (Table 2). “Patients who misused alcohol, used illicit drugs, and/or had depression were more likely to commit dating violence, regardless of the patient’s gender,” says Dr. Singh. African-American race was another factor associated with dating violence for both males and females. In addition, females who reported dating violence were more likely to be on public assistance, have lower academic grades, and to have visited an ED in the prior year for an intentional injury. Singh V, Walton MA, Whiteside LK, et al. 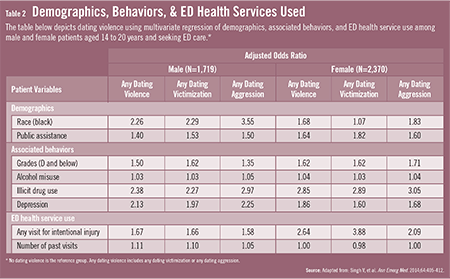 Dating violence among male and female youth seeking emergency department care. Ann Emerg Med. 2014 Jun 29 [Epub ahead of print]. Available at: http://www.annemergmed.com/article/S0196-0644(14)00486-7/fulltext. Moyer VA. Screening for intimate partner violence and abuse of elderly and vulnerable adults: a US Preventive Services Task Force recommendation statement. Ann Intern Med. 2013;158:478-486. Cutter-Wilson E, Richmond T. Understanding teen dating violence: practical screening and intervention strategies for pediatric and adolescent healthcare providers. Curr Opin Pediatr. 2011;23:379-383. Walton M, Cunningham R, Goldstein AL, et al. Rates and correlates of violent behaviors among adolescents treated in an urban emergency department. J Adolesc Health. 2009;45:77-83. Erickson MJ, Gittelman MA, Dowd D. Risk factors for dating violence among adolescent females presenting to the pediatric emergency department. J Trauma. 2010;69:S227-S232. Vijay Singh, MD, MPH, has indicated to Physician’s Weekly that he has or has had no financial interests to report.